One of the best-loved saints of all time, Francis of Assisi is often depicted today as a kind of proto-hippie or early environmentalist. This book, the most comprehensive study in English of Francis's view of nature in the context of medieval tradition, debunks modern anachronistic interpretations, arguing convincingly that Francis's ideas can only be understood in their 13th-century context. Through close analysis of Francis's writings, particularly the Canticle of the Sun , Sorrell shows that many of Francis's beliefs concerning the proper relation of humanity to the natural world have their antecedents in scripture and the medieval monastic orders, while other ideas and practices--his nature mysticism, his concept of familial relationships with created things, and his extension of chivalric conceptions to interactions with creatures--are entirely his own. 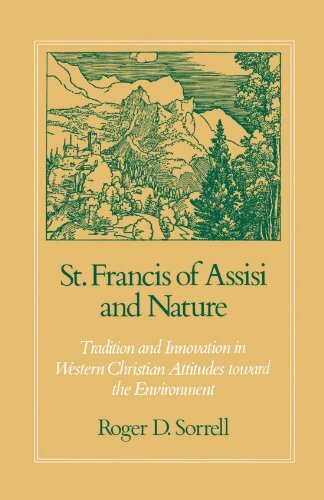 Sorrell insists, however, that only by seeing Francis in terms of the Western traditions from which he arose can we appreciate the true originality of this extraordinary figure and the relevance of his thought to modern religious and environmental concerns.